Our hardwood flooring company has an excellent reputation with satisfied home owners and remodelers all around the Atlanta area. We want to serve you the best we can and are always willing to go the extra distance to please our customers. Traditionally, dust collection for floor sanders consisted of attaching a cloth bag to the exhaust pipe of the sanding machine. 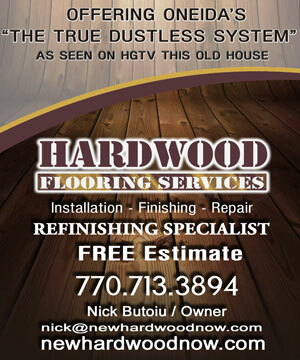 At Hardwood Flooring Services, Inc we are using the patented Oneida Vac Dust Containment System. Our dust containment system is a totally new and innovative solution to the problem. In place of a bag, a super-efficient cyclone that attaches to the exhaust of the sanding machine is put in its place. Cyclones are centrifugal separators that use gravity and air speed to separate material from an air stream. Many companies will tell you they have a dust free system but this doesn’t truly exist. What we offer is a system that minimizes the dust and leaves your house clean. This isn’t just a statement from us but what our customers tell us as well. Hardwood Flooring Services uses Oneida Vortex DCS - Dust Containment System's. The cyclone spins the dust-laden air stream and drops the dust out of the bottom into a clear dust cup. The air stream which now has only a small amount of ultra-fine dust in it exists the top of the cyclone and goes through a high-efficiency cartridge filter. The filter removes particles down to below 1 micron in size. A pencil point is approximately 100 microns, so there is essentially no dust emission from the filter. The dust that is separated into the bottom cup is carried away by a vacuum pump through a 1 1/2″ diameter hose that transfers the dust outside the work area to a 35 gal. drum. The drum uses another small cyclone to drop the dust into a plastic bag. The airstream continues through the pump and through a last filter that removes any fine dust from the air used to convey the dust from the sanding machine. The results allow for a clean surface when preparing your floors for application of stain and finish and further eliminate the concerns for any air borne dust settling into the finish after it has been applied as was the case with the old bag method. When it comes to finishes we use the best product on the market: BONA TRAFFIC HD. Is not cheap but is the best! 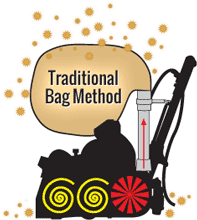 As the sander fills the bag with wood waste, air flow drops off considerably as the bag becomes clogged with dust. Fine particles are then forced through the woven fabric of the bag, creating large clouds of messy, harmful dust. When the operator stops to shake the bag clean they scatter dust everywhere, exacerbating the problem. A minimum of 200 CFM is needed for a 110V system to overcome air resistance in the flex hose. To accomplish this you need higher horsepower, large diameter hoses, and shorter hose runs. This leads to a loss of mobility, louder noise, more weight, ineffective dust pick up at the source, and necessitates having to locate the vacuum in the work area. 75% of the air is vented directly through the attached replaceable HEPA media filter. The remaining 25% of the air and all of the wood waste is transported through small diameter hose to the dust drum up to 100′ away. Splitting the air-at the source ensures that the sander always has a continuous flow of air, significantly improving sanding performance and reducing downtime for cleanup.